Necia Stencil is a sans serif typeface created by Pablo Balcells and published by Graviton that has part of Necia font family. This stencil version is available in 16 styles divided into two: the 8 “Stencil 1” with some details perfect for rigid materials printing and the 8 “Stencil 2” ideal for light materials printing . Also it can be use for headline, magazine, logo, poster, video game etc. Enjoy! 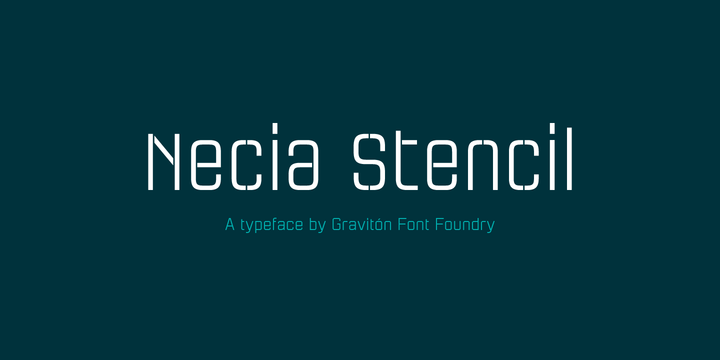 Released: 2014 Note: Necia Stencil is a thrademark of Graviton. A font description published on Wednesday, January 28th, 2015 in Fonts, Graviton, Pablo Balcells by Alexandra that has 3,877 views.